It could be the snow, or the grey sky, but something is drawing me to post about haiku recently published in Haiku Canada’s most recent publication, the Haiku Canada Review. Perhaps I’ll do anything to stop me from going downstairs and having another piece of the custard cake I made earlier; I’d never tried this before and thoughts of literally diving into its creamy custard are very strong. So it’s a good day to write this post, one I’ve wanted to do for a while, on the power of very short haiku. LeRoy Gorman has edited the Review for forever. Each issue usually includes a few broadsheets called Haiku Canada Sheets by selected poets. It’s an honour if he chooses to produce one with your haiku as it gives you the opportunity to have a small collection of your poems out in the big wide world. Each issue also contains tanka, renku, haibun and other Japanese form poetry, as well as reviews, essays, and as they say, more. 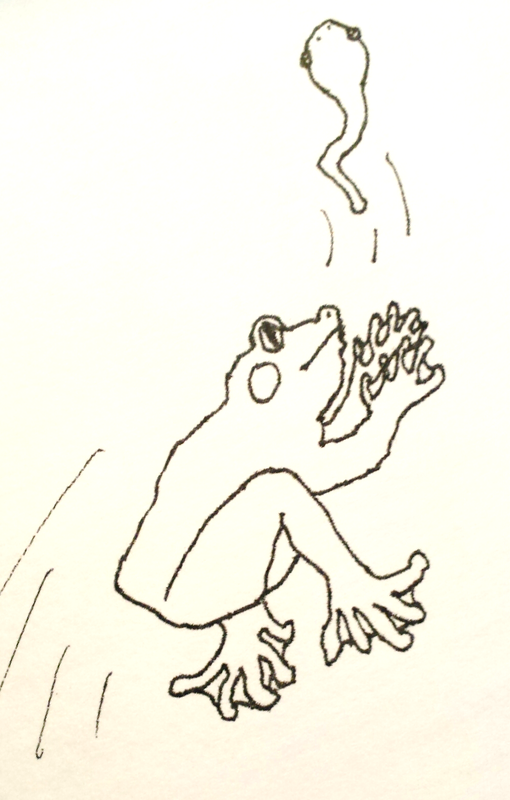 Members can submit artwork which every issue includes, often lovely drawings like the frog on this issue’s cover, and at the head of this post, drawn by Brent Partridge. The poem was written after his wife Pat died. Ms. McCullough has done wonders bringing Allan’s philosophy to the fore. After all, 99.99999999 % of people wonder what the big deal is, with haiku, anyway. She quotes some of his thoughts about his relationship with haiku. He has learned from Issa, he said, “a little…about the fashioning of both delight and despair.” In the poem above, I can be with him in the dark, the dark being much more after Pat’s death than an indigo sky; this dark is the dark that makes us think the light can never come back again. Some might say that the poem makes little sense- how can the dark make you unable to hear. That’s the power in this poem. A good haiku brings you into it, makes you want to spend time with it, to be where the poet is, and to expand the insight that comes into one that enters one’s own life. Nine words, and they could have been the whole eulogy at a memorial service. And without knowing the background story, I knew a background story, I knew a moment, I knew his eyes, and I was a granddaughter remembering my grandfather’s face, remembering his hands, and the way he sat, how his attempts at speaking English are still in my ears. The poem grows as you spend time with it. A lyric poet with the same set of circumstances would have written stanzas, a sonnet, used reams of words to get in every wrinkle, every good deed, every special time with her grandfather, but these nine words contained all of that, and more. It’s what we would be thinking in the same situation, but that she has captured that moment in five words fills me with awe. Read it again, and again. It will stick with you and come back to you when you need it. It’s the kind of poem that sticks for there is no stress about remembering it. You know already that it is part of you. The comparison of flickering flames and flickering thoughts is clear, and, at first, the poem looks rather light as compared to the previous ones. But our deepest thoughts need not be about sad times, they don’t have to make your emotions run up and down the scale. This poem is a quiet one and brings to mind the times when people are together trying to share thoughts, when those people might wonder about what a person’s words might mean. It’s a poem of uncertainty. Flickering thoughts could indicate doubt, or hesitation. They could be very important in any kind of relationship and are sometimes hard to pin down. These flickering thoughts, and the image of the person’s face in the flickering light…even that image is strong enough to be frightening, or calming, or loving, or simply an exchange of philosophical ideas. This little poem is packed if you take time with it. A serious decision, and these seven words express the problem. The poem suggests everything that goes through a person’s mind when the question of giving a eulogy comes up. Seven words that say it all, the guilt, feelings of duty, feelings of love, the last chance to say what you want said, the fear of not saying it completely, of letting people down, of what others see as your responsibility, and more. There, it’s taken a paragraph to begin getting into this one. For behind it are all the commonalities, the losses that have already been experienced, the idea of funerals and memorials, possibly a fear of speaking in public, all those eyes and ears in the room or chapel, that you may not believe in eulogies, that giving one may take all the strength you have. tugs at me. A boot is crushing the most delicate of creatures, those brilliant dusty wings, or perhaps just a torn off wing. It calls into question why a butterfly is on the ground, the heavy boot that possibly means a hike, a good thing in autumn air, but oh, doesn’t it bring to mind innocents in all parts of the world that are under the ‘boot’. This poem comes very close these days as our neighbours to the south are losing healthcare, and the right to live their own lifestyle, when everything good is endangered, even our earth. It is the refugees who are walking to Canada through the snow. Enough said, the poem says it all, and much more if you let it seep into your self. has more to offer; she gives us the romance of camping in a northern wilderness, and its inherent dangers. The poet lives in Whitehorse, Yukon. She is a woman who experiences the possibility of having only canvas between her and a grizzly, so images of long curved claws haunt the poem. She would not have been alone, most likely, and would have taken all precautions. After all, bears are fairly common around where she lives. There is even a bear incident map that indicates all human-bear conflict in the Whitehorse region. The danger is real. This word play contains a recognition of danger, but the poem also shows the spirit of an adventurer, one who will not give up having great experiences because there is a possibility of risk. We have here, the Yukon version of climbing Everest, one small bit at a time. I like the levity, the devil-may-care quality of these few words. These few words are more ‘intense’ than an initial reading may have suggested. So thank you, thank you, LeRoy, for what you’ve done for Haiku Canada, for selecting and publishing poems all these years. Because of the Review we know our fellow poets across Canada and many places in the world, and have been kept aware of the development of Japanese form poems as they develop outside of Japan. No one else could have done it, but you did. Months of collecting, making decisions, doing layout, mailing out hundreds of issues. And thank you poets, for writing these very brief, but wonderful, poems. Did you send this to Charlotte? Yes. Thanks for the comments Marco! You have to go to Jessica’s Old Pond Site and click on the ‘Shop Now’ button. I tested it and It works really well. I wonder if something like that would work for your press? I’m also thinking we might be able to set something like this for HC members to sell their books. I found this fascinating. It reminds me of Sue Goyette saying “poetry is in the spaces” (and I’ll add, “words are the signposts”). Thank you, Claudia, for your thoughtful thank you to LeRoy and the poets. Thank you Janet; I always enjoy hearing when something connects. We do owe so much to LeRoy, and he seldom gets any credit, much less the credit he deserves. Thank you for this wonderful surprise, Claudia, and for your sensitive interpretations of the featured poems. I also extend thanks to LeRoy for everything he does to promote the work of members. I treasure the Haiku Canada Sheet he created for me! Thank you for this wonderful surprise, and for your sensitive interpretations of the featured poems. I also extend thanks to LeRoy for everything he does for members. I love my Haiku Canada sheet! Thank you Debbie… Of course you like your wonderful Sheet! Nothing there not to like! Smiling! Sorry for the double post. My comments seemed to disappear, so I tried again. I’m relatively new to WordPress, so I’m not yet sure how everything works. Wishing you a grand day! It might take a while for them to post all the comments, but I think it will appear. Lovely to be in touch with you! Hi Terry; Yes, I did. He thanked me… Thank you for your comment! That is the beauty of Art, that the observer may get even more out of the piece than the originator put into it. I love this aspect of haiku. A moment’s thought that works and a quick scribble, yet others may ponder it for way longer, and keep pondering, as such a short poem is almost automatically memorized. you just can’t help it1 Thank you for your comment, Jennifer! Sorry to hear about the passing of Allan Brown. Yes. Haiku poets among others will miss him in their communities. Thanks Alan, for remembering. Thanks so much, Frank, and Claudia!